Being calm is a quality very few of us has mastered. We lose our cool many times daily, we can lose temper with our loved ones when we are mad, but we can’t act the same when we are at work. Ironically work is the place where you cannot stay calm all the time. Issues like office politics, colleagues stealing your ideas, work pressure and work-life balance; there are several reasons by which we lose our cool. A good professional stays cool and does not express his emotions abruptly. How to Stay Calm at Work? 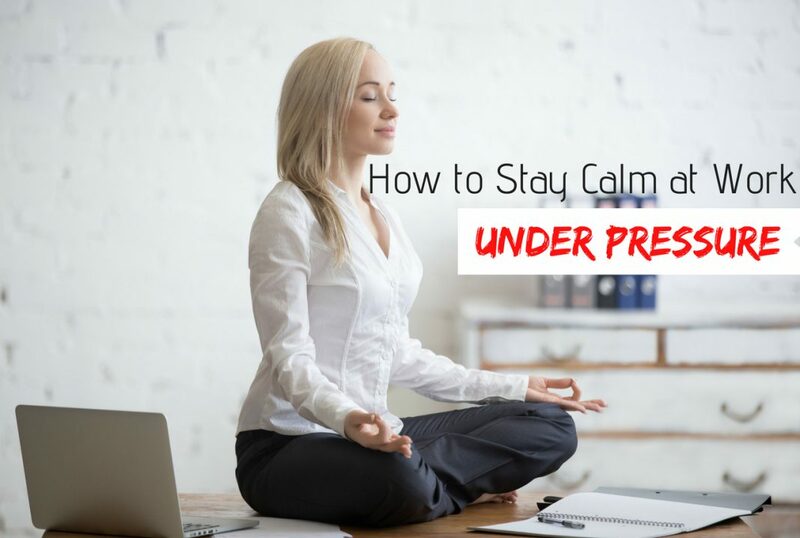 If you often lose your cool at work and need ways to stay calm at work, you have come to a right place. Read on to know easy ways and make your work life less stressful. You may not notice but when you are engrossed in some work you tend to breathe very shallow. This makes us dizzy, light headed and reduces our ability to focus well. This, in turn, reduces your productivity and makes you feel frustrated for taking so long time for doing things. When you feel stressed, take a deep breath, hold it in for a second and breathe again. This is a sort of meditation which will help you to calm down. Include these exercises in your daily routine whenever you take breaks. At work, practice deep breathing for at least 5 minutes. Sometimes it is not only one thing that causes stress, but a series of trivial matter that makes you feel overwhelmed. You get frustrated and after a while, feel stressed about it. When you face such scenario, try to evaluate what are the things which went wrong that day and how you can correct them. Systematically come to a solution of each and eliminate the trouble. Take a look at your desk, do you find loads of files scattered and a huge mess of things all over? If the answer is YES, then this can be one of the factors that drive you crazy. Answer me honestly; wouldn’t it be great if you knew where exactly have you put things, so that you can get it quickly when needed? Have a habit of organizing your desk when you start your day and tidy it up when you leave from work. A small plant, 2-3 pictures, some motivating quotes can brighten your boring desk and also help you to stay calm. We all agree that sitting at one place all day is boring and impossible. It is advised you take frequent breaks, a small stroll within the office, a little stretching at your desk or just a stroll to a coffee machine can help you stay fresh and attentive. A workplace can be stressful and negative. Undue work pressure, negative colleagues and other things can get on your nerve and make you negative. But always remember being negative will do no good; it reduces the capacity of us doing well. No matter how grim and frightening the situations are, put on a brave face and have a positive attitude. There are many people at a workplace that will criticize you and doubt your decisions. Although criticism helps you to do better, it’s not always necessary to listen to everyone, maybe some people do not want you to do well and will criticize you to see you fail. To have a calm mind, you need to trust yourself and not change your plans every now and then, as someone else does not approve of it. Changing plans frequently will stress you out and affect you badly. I know it’s really hard at times to be positive, but it can be easier if you appreciate yourself for the small things you achieve. When you have a time crunch and when you are struggling to meet a deadline, take a moment to let yourself know that you are doing well and can do things on time. Beating yourself up for small fails can be very stressful. Some people take a break from work but yet again they think and discuss about work. So practically it is just a change of location and you are still working. A stroll in a park can refresh you. But not when you keep thinking about your work. When you are on break, make sure it’s actually a break and you focus on other things and do something relaxing. An unorganized work is one of the main causes of worry and stress at workplace. An undue pressure of doing things may make you lose your calm. It is advised you plan your work carefully and stick to it. If you have any meetings and appointments make sure to add it to your calendar to remind yourself. Instead of starting your day by checking your emails, start your day by making a to-do list, you must prioritize the things and take care of the urgent task at first. Make a realistic schedule and assign estimated time for each task. Sticky notes on your PC or note on your desk is a good idea to remind yourself of things. There could be many distractions like, about a colleague, company sports event or just a gossip that you can’t resist, so make sure you stick to your schedule and finish the maximum task on your list. I know this is easier said than done. As the fact remains that, we all hate changes and want things to go as we planned. At a workplace, there are high chances that things may not work as per your plan, so as per the circumstances you need to modify your plan. You should accept that this is bound to happen, and you should not get frustrated by these changes. A flexible professional can achieve a lot. There are often many instances that you had to miss important events of your social life to take care of work commitments. But answer me honestly, Will you be able to pay full attention to the presentation you give by missing your child rehearsal or by not taking care of your sick loved ones? Always remember that we work to have a good personal life. Know your priorities well and try to manage things. By outsourcing few household chores and by making prior arrangements at work will help you to spend quality time with your loved ones. I would also like to add that some of you have a physical presence at home but are constantly thinking about your work, this will hurt your loved ones and spoil your relationships in long run. Be actively present in the family and your social life. This will help you to have a well-rounded life and you will be a happy individual. There may be instances when you have too much workload and you do not have time to take up added responsibilities. At times it helps to be assertive and say NO to things. Overcommitting yourself will stress you out and may make you lose your cool. You can politely refuse if you have too much work at hand. Learning to prioritize is the key to stay calm. If something is not that important to do, you should skip it. Let me be clear, I am not asking you to procrastinate, but avoid doing things which can really be done later. There could be some instances at work, like going through a bad presentation, clients complaining or teammates not doing well with the targets. It’s natural to feel worked up. Counting to 10 gives you some time to gulp down that anger or frustration and start afresh. Some people at work gossip a lot and waste others time, it is good to mingle with people at work but engaging in unnecessary gossip will do no good and you will lose track of your work. Stay away from such people and assertively reply them that you have work to finish. You can put on headphones so that they know you do not want to be disturbed. Painting, playing video games or enjoying your favorite sport; hobbies or be anything, but one thing that it has in common is, it is thoroughly enjoyable as it relaxes your mind. It lets your work stress go away. Take out time for yourself and make sure you indulge in your hobbies. Some ‘me time’ is really necessary to stay sane in this competitive environment. Until and unless your mind and body is healthy none of the tips or tricks is going to work on you. Having a healthy diet and moderate exercise keeps you fit. Nagging health issues are a great cause of stress. Meditate for 5- 10 minutes daily. Few offices also have a gym; take advantage of this and workout for a while. Exercise makes you energetic, active and makes you feel happier. When you surround yourself with people who are motivated and dedicated to their work you can also feel motivated to do your work faster. It is also said that positivity attracts positivity. Although it is hard to find like-minded people at work, it is not totally impossible. Nobody is a ninja who can do all perfectly; everybody needs help from time to time. You should not feel guilty to ask for help. You get an idea of how others approach the same task that you have been doing, maybe you can get to know an easier way to do that. You can always return the favor by helping them back in need. This way you can also bond well with your coworkers. You may have noticed many people keep on complaining about things but hardly ever come up with a solution, instead of being crazy over problems, think of ways to resolve it. Let us consider a simple example of a broken printer, a stressed out person will get extremely mad at this thing as he could not get the prints on time. Do you think this simple thing is so hard to resolve? You can go to another department to get your prints and let know someone to get the printer repaired. Also, there could be some situations which are really not in anybody’s control, in such cases remind yourself that you did your best to get things done, somehow it got delayed and it’s a part of your work to face difficulties. This is really a simple tip and needs no explanation, by delegating your tasks you can surely reduce your stress. Take help of the interns or juniors that work in your office, few task which requires a little supervision can be assigned to them. Work is stressful but I’m sure if you follow the above-mentioned tips you can let off some of your pressure. I will be glad to know some incidents where my tips helped you. Comment below, with any other tips that can help all of us. Previous articleWhat To Do At Work When There Is No Work?